The documentation and meeting house in front of the cemetery, the so-called "cemetery of honour" was established in 1946 by the French military administration on the grounds of the former guard accommodation. 217 people are buried here who could not be repatriated in their home countries after the war. It became more and more the beginning of the memorial. Georg Baldy and later his son, Bernhard Baldy, have been taking care of the graves since 1958. Many of the meanwhile deceased survivors of the concentration camp from different countries contacted them whenever they returned to the place of their imprisonment to pay their tributes to their murdered comrades. Until the 1990s, the grounds of the cemetery had a shadowy existence. 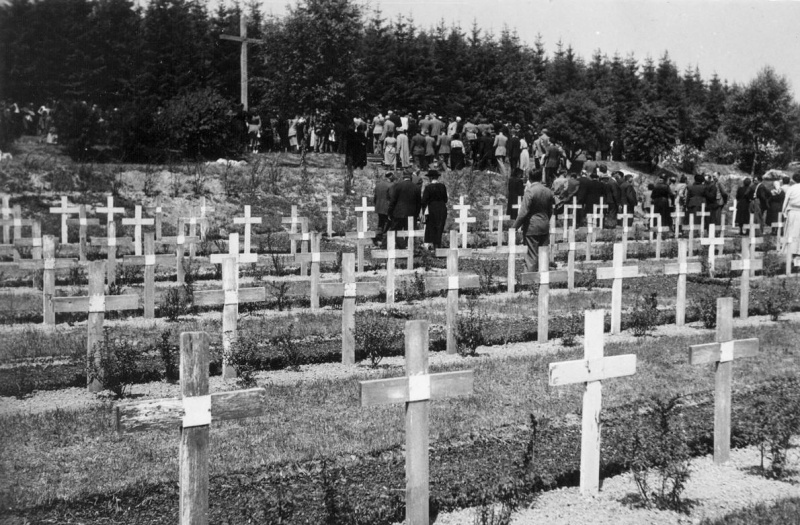 The character of the furtive place was reinforced by the name "cemetery of honour" which was used until 1994 and actually covered up the background of the concentration camp. Documentation and Meeting House from the former Concentration Camp at Hinzert, the Rhineland-Palatinate State Government together with support from all four parliamentary parties, decided in favour of an architecture bid in 2002 to build a documentation house. Led by the Civil Engineering Department of the Ministry of Finance and under concurrence of the chamber of architects for Rhineland-Palatinate, an international bid was carried out and included Luxembourg, Lorraine, Wallonia and the German-speaking community in Belgium, Saarland and Rhineland-Palatinate. From 28 drafts submitted, an international jury comprised of architects, historians and former deportees from Luxembourg and France, selected the draft by the architect company Wandel-Hoefer-Lorch & Hirsch from Saarbrücken.